Like never before, Christians are being challenged by God to honour Him by standing up for their belief in Him. Olympic athlete and Dancing With the Stars contestant Jennie Finch refused to perform to a popular new Janelle Monae track, citing her Christian faith and desire to honour God. The song, “Make Me Feel,” is sexually suggestive and was deemed to be a “little too risque” for the athlete. According to the Kansas City Star, Finch was struggling with the song all through rehearsals until she finally made a phone call to producers saying she was not prepared to dance to such a sexually charged track. “It’s not what I’m about. I need to follow who I am and stand up for what I believe in,” Finch explained on the hit show. Last year, a Christian soccer star, Jaelene Hinkle, withdrew from the United States Women’s National Team after the team decided to swap out their normal jerseys for LGBT Pride jerseys in international matches. Hinkle withdrew from the United States soccer roster in June citing “personal reasons.” This came at a time where she was called to play in international games versus Sweden and Norway. 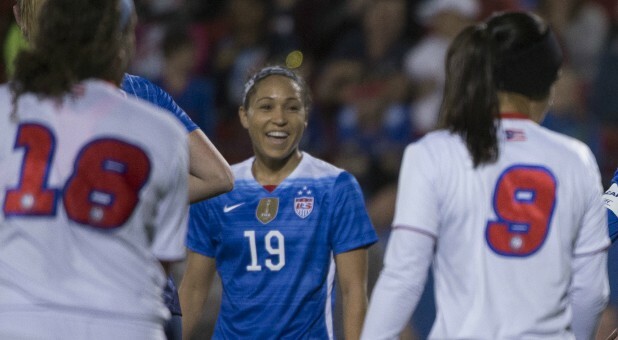 United States defender Jaelene Hinkle 19 and midfielder Carli Lloyd 10 and defender Kelley O’Hara 5. Hinkle’s resignation from the team came two weeks after the U.S. men and women’s national teams announced that they would be wearing LGBT pride jerseys in support of the June pride month.